Our best upgrade yet: The latest Mercedes-Benz CLA and GLA four-door vehicles are now available as part of our fleet! For the epic moments - and everything in between. From finding a car to ending your trip, here's how to do it all. car2go’s Mercedes-Benz CLA is a sleek sedan and car2go’s Mercedes-Benz GLA is a sporty crossover with good cargo capacity. Both models have more than enough room for you and your friends to embark on any adventure! Not only do our new vehicles comfortably seat more people and cargo, but they’re also equipped with new features, so you and your passengers can travel in safety and style. Heads up! The key is located inside the glove box. 1. Return the key – blue keychain tag first – to the slot/holder located inside the glove compartment (just like you found it when you started your trip). 2. Check that you have all your stuff and then exit the vehicle. 3. 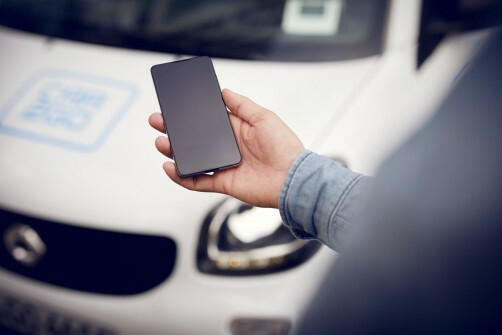 Once outside the vehicle, simply tap “End Rental” in the app. Point A, meet point B. 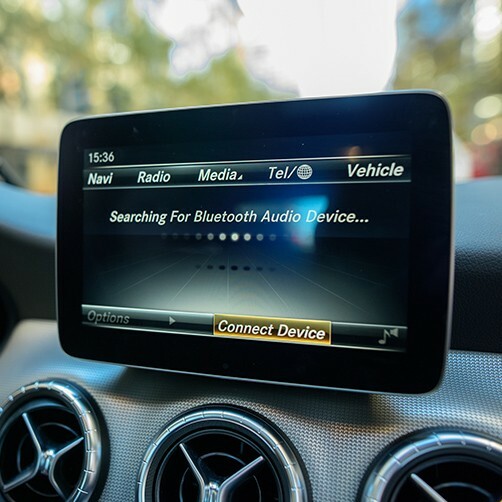 Every car2go Mercedes-Benz has navigation with traffic updates - no need to juggle your phone to get directions (both hands on the wheel, please!). Click "Select" and you'll be on your way! Activate Bluetooth to jam out to your playlists… or call your mom (she misses you). 4. Authorize your phone using Secure Simple Pairing or a passkey, and voila you’re done! Don’t worry: once your trip ends and your phone unpairs, all your phone’s information (like contacts) will disappear from the car. The gear shift is the lever located on the right side of the steering wheel. With your foot on the brake, you can shift the vehicle into Drive or Reverse by moving the lever up or down. To shift into Park, just press the button on the end of the lever. The mirror adjustment dial is on the driver’s door armrest - first select which mirror to adjust, then use the 4-way dial to fine-tune it. The seat adjustment controls are on the door and are in the shape of a seat, so you can adjust each seat segment to your exact specifications. To move the seat forward or backward, push or pull the buttons to move the seat in that direction. Now it's juuuust right. Even though your dash may glow, it doesn’t mean your headlights are on. Turn the knob on the dashboard to the left of the steering wheel. Once the lights are on, the green headlight icon will display on the dash. A safe bet is to set the headlight switch to the AUTO setting, which ensures your car automatically turns on its headlights when needed. To use the front windshield wipers, twist the end of the lever on the left side of the steering wheel. Press the button on the end of the lever to wash it. To use the back windshield wiper, push the slider located on the middle of the lever up. To wash the back window, push and hold the slider down. Opening the trunk of a car2go Benz couldn’t be easier! 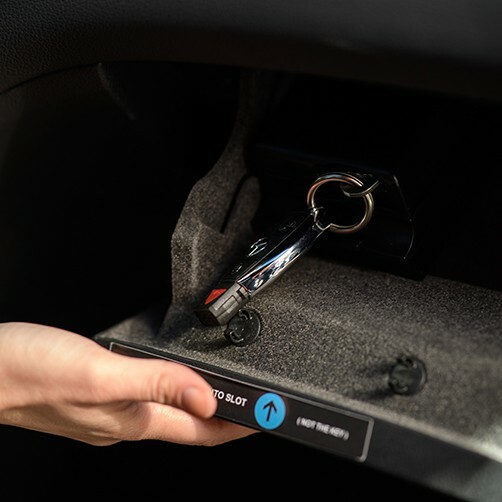 On select models, you can even use the Hands-Free Access feature to open the trunk by waving your foot under the back bumper as long as you have the key with you! To fold down the back seats, pull the release button located on the top corner of the back seat and pull the seat back down. Both seats fold down in the CLA and GLA models. Find the perfect vehicle to fit your needs. Simply tap on the toggle icon at the bottom of your screen and you can easily choose which vehicle type you want to drive. Turn them all on if you're not feeling picky! Want to treat yourself to a Mercedes-Benz for a few hours while running errands? Turn off "fortwo" if you're only interested in a Mercedes. Congrats, now you can pick and choose what kind of vehicle you want!